W 202 FlakStP. Peil, Alderney. Les Iles Anglo-Normandes. 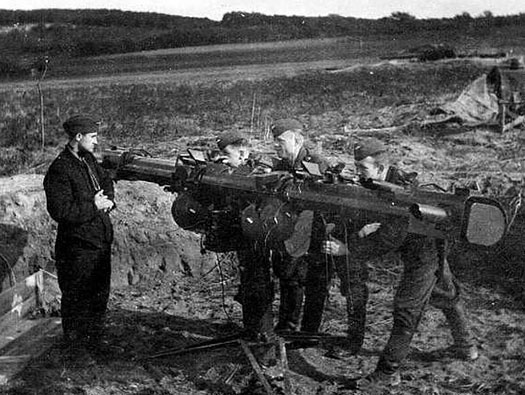 2cm Flak with full crew. 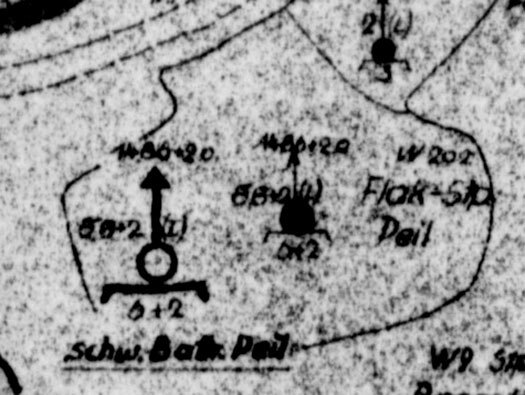 Plan of the Flak site with six 8.8cm and three 2cm and an M.G. AA. 1 x AA machine gun. Many ammunition stores and accommodation bunkers of field type and wooden huts. Victorian pump house. It is sat right in the middle of the 8.8cm flak site. 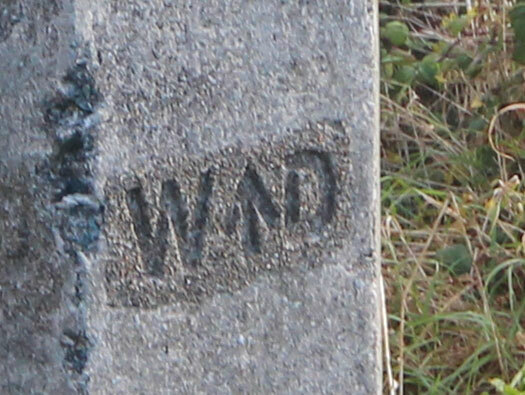 War Department boundary stone. A type of stone I have never seen. Its tall and oblong with WD and the broad arrow on both points. Plan of War Department stones. Alderney, W 202 FlakStP. Peil Boundary stone. War Department, we now call it the MOD Ministry of Defence. Alderney, W 202 FlakStP. Peil Victorian well and pump. The Victorian well and pump. I do not know what powered it but it must have filled the cistern next to it and either pumped to forts around the island or water carts came here, filled up and then delivered. Alderney, W 202 FlakStP. 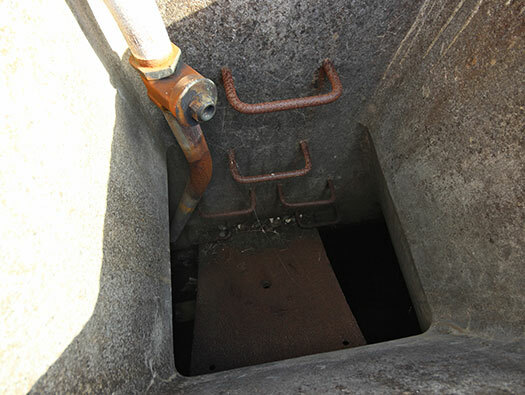 Peil water cistern. The water cistern looks as though it was upgraded by the Germans. Looking down into the water. The steel steps down inside look German?? Alderney, W 202 FlakStP. Peil Early Flak position. Two of the ammunition niches. Alderney, W 202 FlakStP. 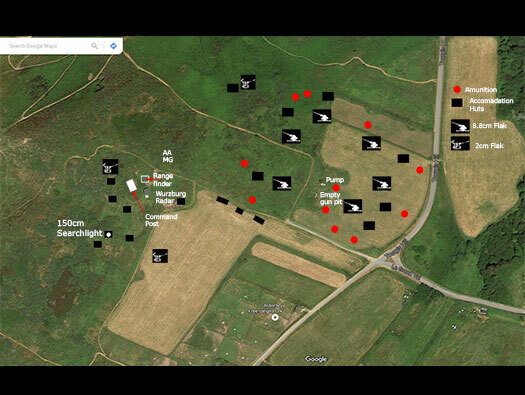 Peil l Early flak position. The view with the 8.8cm flak spread out around us here and in the far distance the radar Würzburg. Alderney, W 202 FlakStP. Peil radar Wurzburg. Again looking towards the radar but here were at least three huts possibly wooden along here. The sky they were defending. PRU Spitfire came over as often as they could be tasked. Zig Zag path below down to Fort Clonque. 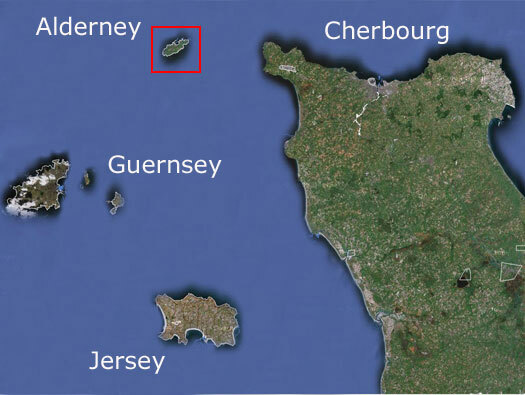 Alderney, W 202 FlakStP. Peil One of the Flak positions. Looks like a ready ammunition space?? 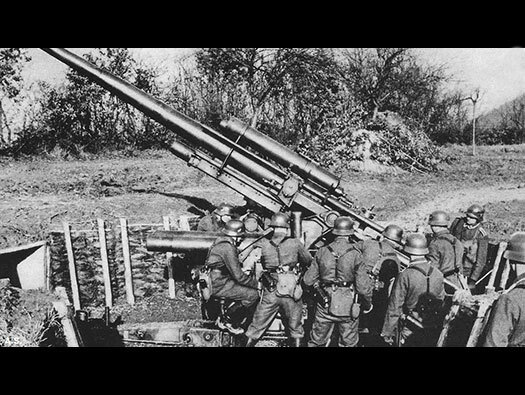 8.8cm Flak in field position. This flak position could be anywhere in Europe. Flak, radar and range finder. Heavy range finder that may have been in the OP here. Before radar this was the way aircraft were looked for, targeted and then information on height and speed through telemetry would be transmitted the information to the guns. Layout of a six gun flak batterie. Würzburg radar instillation and a bunker fanatic, good friend and tour guide www.atlantikwall.org.uk. Not sure what this was?? this could be a generator house to run the power for the flak site?? 150cm searchlight in a field position possibly like the one that was here.